For other places with the same name, see Ścinawa (disambiguation). 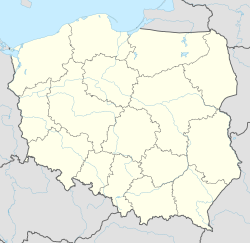 Ścinawa [ɕt͡ɕiˈnava] (German: Steinau an der Oder) is a town and municipality on the Oder river in the Lower Silesian region of Poland. The town features a number of historic monuments including city hall (19th century) and the town church (1209). The Ścinawa train station is a key gateway for travel throughout the region, connecting major destinations such as Wrocław and Głogów. The current mayor of Ścinawa is Andrzej Holdenmajer. Presently, the town's population is 6,053. Between 1975 and 1998, Ścinawa was in Legnica Voivodeship. It is now part of Lubin County in Lower Silesian Voivodeship, and is the seat of the municipality called Gmina Ścinawa. Ścinawa was first documented as a possession of the newly established Trzebnica Abbey in a deed issued by Pope Innocent III, which dates back to 1202. Town privileges were first granted between 1248 and 1259 by Konrad I, Duke of Głogów. The town church of St John's was first constructed in 1209. After the partition of the Duchy of Głogów by Konrad's sons in 1273, Ścinawa became the capital of a duchy in its own right under the rule of Konrad II the Hunchback. It was again united with the Duchy of Głogów under Duke Henry III in 1290. His son Jan, sole ruler at Ścinawa from 1317, paid homage to King John the Blind in 1329, after which his duchy became a fiefdom of Bohemia. Though the Polish king Casimir III the Great had renounced his claims to Silesia with the 1335 Treaty of Trentschin, he campaigned Silesia and in 1343 laid fire to Ścinawa until in 1348 the conflict was finally settled by the Treaty of Namslau. In 1358 Jan sold half of the Ścinawa to his cousin Duke Bolko II the Small of Świdnica, the only ruler of the Silesian Piasts who had refused to become a Bohemian vassal. Nevertheless, upon Bolko's death in 1368, his half was annexed by Emperor Charles IV. As a part of the Bohemian kingdom, the remaining half of the Ścinawa lands fell to Duke Henry V of Iron at Żagań in 1365 and in 1397 was acquired by Duke Konrad II the Gray of Oleśnica. Under the rule of Duke Frederick II of Legnica, Ścinawa became part of the united duchies of Wołów and Brzeg in 1528. With the Lands of the Bohemian Crown, Ścinawa since 1526 belonged to the Habsburg Monarchy. It was heavily devastated during the Thirty Years' War, when in October 1633 Albrecht von Wallenstein's troops nearby routed a Swedish corps under Jindřich Matyáš Thurn. Upon the death of the last Piast duke George William in 1675, his lands fell to the House of Habsburg as reverted fiefs. With most of Silesia, Ścinawa was annexed by Prussia in 1742 and became part of the German Empire in 1871. Fiercely embattled between the Red Army and the Wehrmacht in the last days of World War II, the town to a great extent lay in ruins after 1945. The German population of Ścinawa was expelled and replaced with Polish settlers, according to the Potsdam Conference. The town's soccer team, Odra Ścinawa, was established in 1946. Ścinawa also has a karate club named "GOJU-RYU" which has been very successful in regional, national and international competitions. In addition, each year Ścinawa holds swimming championships at the local pool. There is also a fishing club and a chess club in Ścinawa. Apart from organized sports, locals enjoy playing soccer, volleyball and basketball. Ryszard Komornicki, a former Poland player and a former manager of FC Aarau, was born in the town. Ścinawa's educational institutions include an elementary school and a junior high school. The town is also home to a local day care. In 2007, the Wrocław Medical Academy established an Alzheimer's Treatment Center in Scinawa. The facility is the first of its kind in Poland and only the second in all of Europe. The building, which cost over 3 million US dollars to remodel, once served as a general hospital as well as an orphanage. Ścinawa has several sister cities, as designated by Sister Cities International. Wikimedia Commons has media related to Ścinawa. This page was last edited on 12 August 2017, at 17:37 (UTC).